These days I have become a monster mom at home. I mean the kind who raises her voice, threatens with a cane and may have been even guilty of using the cane on a couple of occasions when the kid just simply refuses to obey. Oh the whining and the endless whys and whats which goes on and on, testing every shred of patience in your body. And have I even added the screaming and even some tears too, some from her and me as well. If you have a toddler (or two) at home, this may sound like a familiar scenario. But this also made me question just where did all the wonder in my child go? When I was a new mom,I would jump to my feet when Sophie so much give off a squeak. I didn’t even mind when I had to clean and wipe her bum when she had explosive poo every other hour as a babe. How patient I was when I was trying to teach her to call mama, papa. Or when I cheered her when she was learning to take her first steps. But as she got older, or rather entered her twos, somehow the other person who turned into a terrible person was me. And along the way, I’ve also lost the awe and wonder in this child. Don’t get me wrong, I still love and adore her, but when she throws her tantrums and has those meltdowns, its easy to throw those affections out of the window as the disciplinarian in me emerges. It breaks my heart to be harsh on Sophie but thank God she is more resilient than I think and always bounces back on her feet when we make up with a hug and a kiss. But I’m also remembering that children have a very tender heart and we can easily crush their spirits if we are not careful in our discipline. 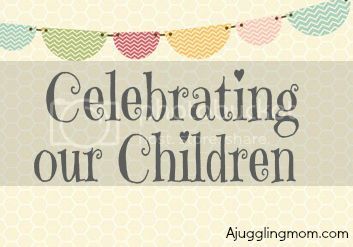 I want to regain the wonder that I once had in my child and I found this list online on 50 ways I can celebrate my child. I love this list and want to share it with you. This list is by no means an exhaustive one but it’s a good start. I’m also reminding myself not sweat over the small stuffs and be more relaxed and be more patient with her. I pray that God gives me the wisdom to bring up this child of mine in the way that He wants, to give me grace that I so need and to regain the wonder and marvel at what a blessing she’s been in my life. Today’s the last day for the Celebrating our Children linky party. To those who have linked up for Celebrating our Children, thanks for doing so and sharing stories on your child and what makes them special. May we never stop celebrating who they are or lose the wonder of who they are and what a blessing they are in our lives. Hi Susan! Just in time for the last linky for this series. Enjoyed following the whole series so thanks for hosting this. I also find myself losing self-control by raising my voice when my girl refuses to listen and obey. Sometimes little things she does just set off another round of discipline. I realise and my husband notices that when I raise my voice when I am angry, she shouts when she is unhappy or angry. She learns to show her unhappiness and anger from me. This makes me realised how my wrong behaviour can have immediate influence on hers. An example I am pretty successful so far….I tell her way ahead that if I see her throwing things on the floor on purpose, I will use the cane and hit her hand. When she throws things around, she knows the consequences of mischief. After caning her little hand (only once), I will tell her that I love her that’s why I need to correct her wrong behaviour. Sometimes she will cry in my embrace but I know she knows that I do that out of love. In a second, her tear will turn into laughter again. When I tell her in advance what to expect when she misbehaves, I know how I should respond when things happen again and she knows what to expect. It helps me to be in control of the situation and not lose myself and regret later. Yes I so need to be reminder every so often. And thank God that our kids are more forgiving and they forget about it too. I pray that I will bring her up in love and patience and not flare up so easily at her. But you’re right that letting them know our expectations helps in managing their outbursts. Just got to watch our attitude and behavior when we discipline. Do you threaten with the cane or really use the cane on them? having kids is a true test of patience. i’m not a stranger to yelling, but i try to nip things in the bud before they start. i have a 4yr old and we sort of went through a terrible two phase but i learned that positive reinforcement, explaining to them very clearly what the expectations are and giving them (mommy-approved) choices is what works best to curb bad behavior and encourage good behavior. because of this, i rarely need to use timeouts/punishment. of course a 4yr old will be a 4yr old and she has her moments which results in me yelling and then feeling bad about it but for the most part, things go pretty smoothly. don’t beat yourself up. you’re not turning into a bad person; you’re learning how to deal with a little person who is also learning how to understand things. this kind of learning will go on until your child is like, 30! Thanks for the encouragement Kathy. 30 is a long long way to go. Not having to punish is a great thing. I’m learning that I need to manage my expectations of my little one as well and letting her know her boundaries and limits are what can keep that in check too. The twos are such a patience-tester! Tks for reminding me to enjoy the “lost wonder” though because soon enough, our kids will be grown up and these twos will just be a silly memory! I know we’ll survive them ;). Sigh, the terrible twos have come 3months early for my twin boys…sigh!